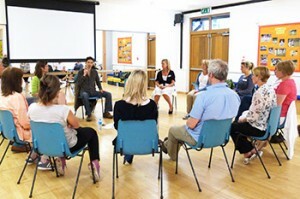 These courses are certified and developed by the Mindfulness in Schools Project. Your trainer Chloe has been fully accredited to teach each individual curriculum and has trained exclusively with the Mindfulness in Schools Project to deliver high quality and meaningful lessons which pupils enjoy and benefit from. Paws b is for children aged 7 -11 and is offered formally as a series of PSHE lessons, and informally through integrating the learning and practice of mindfulness in all National Curriculum subjects and in the children’s everyday life. Paws b – experiences of developing, teaching and learning from Mindfulness in Schools Project on Vimeo. .b is a 10-week course for young people aged 11-18, delivered in the classroom or in small groups within other youth-related settings. .b has primarily been designed for use in the classroom with what we would call ‘conscript’ audiences for 11-18 year olds, although it can also be used equally effectively in other settings. At the most simple level .b is an awareness-raising exercise to give all students a taste of mindfulness so that they know about it and can return to it later in life if they choose to do so. However, for many pupils the course can lead to immediate and striking results: they feel happier, calmer and more fulfilled; they can concentrate better; they have a toolkit to deal with stress and anxiety. Find out more about the objectives and outcomes of the .b model here. .b Foundations is an 8-week course for staff and other adults working in educational contexts to learn mindfulness. Through experiential group learning and discussion participants explore how mindful awareness can support their wellbeing. The training includes twenty minutes daily practice following guided mindfulness meditations at home. How is .b Foundations different to other mindfulness courses for adults? The curriculum is founded on the core mindfulness principles found in MBSR (Mindfulness-based stress reduction) and MBCT (Mindfulness-based cognitive Therapy). In addition .b Foundations has been tailored to make the course accessible and effective for adults in schools. To raise awareness and stimulate demand, the training includes a carefully crafted taster session, along with shorter sessions than usual (90 minutes). .b Foundations also differs in that key attitudes and concepts are introduced visually and kinaesthetically. Aspects of the .b (age 11-18) and Paws b (age 7-11) are included which help build a shared mindfulness language within school. .b Foundations teachers are also trained in styles of delivery specific to a context in which colleagues and potentially line managers may be learning mindfulness together. Is there evidence for the impact of .b Foundations? A recent published study of the impact on 89 secondary school teachers showed significant reductions in stress and increases in wellbeing. This supports the wider evidence base for mindfulness with teachers and adults generally, as set out by Professor Katherine Weare. Contact Chloe to discuss pricing options and how these courses can work for your school. Flourishing Mind can also provide bespoke taster sessions for staff as part of a staff meeting or inset day. Flourishing Mind courses can be run as part of a single school intervention or as part of a shared model with clusters of schools. Enter your email address to follow the Flourishing Mind blog and receive notifications of new posts by email.